SWVA’s latest classic auction was another huge success for everyone involved. Vendors from Ireland, the Channel Islands and all across the UK put their cars up for auction, and they were not disappointed. With a fantastic record crowd attending our drive through Classic Auction, as well as buyers from across the UK, Scandinavia, Holland, France, Australia and Germany, using our own online auction system that truly brings an international flavour, the auction was an exciting and fun event for all involved. A high percentage of selling gave satisfaction to both buyers and vendors, 81% of lots entered into auction were sold. 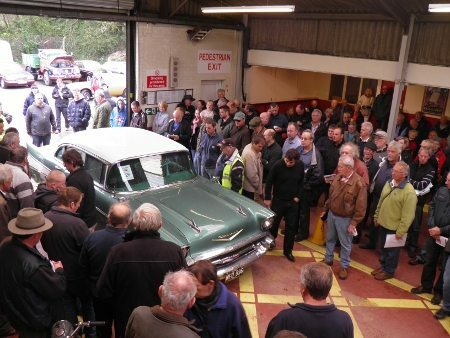 Some of the stars of the day included the 1949 Jowett Bradford van that sold for £7,049, and the 1957 Chevrolet 4.7 Belair that sold for £11,660. We are now accepting entries for our July 26th Sale, with no entry fee and free undercover secure storage available. Current entries include a very nice VW Beetle. For more information, visit our website www.swva.co.uk.